Slice (Android) - Automatically tracks your online shopping orders!! ~ Android Forever! Slice (Android) - Automatically tracks your online shopping orders!! ✓ Track FedEx, UPS, and USPS packages automatically. No digging through emails, no logging into multiple merchant accounts, no copy/paste of long tracking numbers. 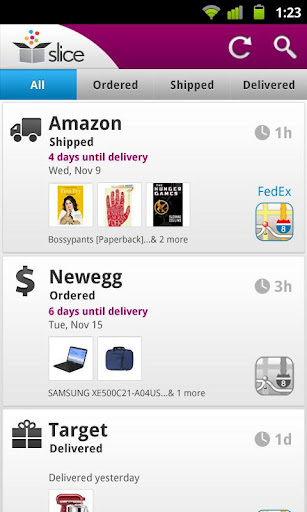 ✓ Get push notifications when a package is shipped, out for delivery or has been delivered, so you always know where your stuff is as soon as there’s an update. ✓ Get notified by Slice when a recent purchase drops in price, so you can contact the merchant and recoup the difference. ✓ Keep track of your Groupons, Living Social and Gilt City vouchers. Don’t miss out on a daily deal because you forgot about it! Slice is FREE on the Android Market!